The two young peregrine falcons that ended up on the ground after their first flights are back at home. They were in rehabilitation for almost two weeks and had a chance to get a bit bigger and to practice their flying skills in a safe environment. They did really well at flight camp and their flights today were strong and confident as they exited the carrier on the top of the parking ramp. They took to the air and were immediately greeted by their mother, Rebecca. Their strong flight and reunion with Rebecca were both great signs that suggest a good chance of doing well in their home base. 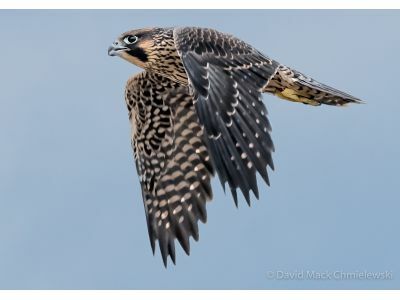 The youngsters will most likely stay in the area with their parents for 4 – 6 weeks after fledging to learn good flying and hunting skills. Then they will disperse to find their own territories. The Fifth/Third Bank would like to involve the community in a naming contest, so stay tuned for more information about that.